There's an old pre-Viagra joke about a man who is having difficulty making love to his wife, so he goes to see a doctor. The doctor gives him some medication and sends him home to try it. The man takes the medicine shortly before he and his wife are sitting down to dinner. Suddenly he's overcome with desire, grabs her, pushes her to the dinner table and makes passionate love to her right then and there. The next week he goes back to the doctor who asks how the medication worked. "Great!" says the man, enthusiastically. "But I'll never be able to eat at Howard Johnson's again." Funny that joke should have been running through my head the other night as we were settling accounts with the waitress at a Chinese restaurant in San Francisco. We had gone to the 21st annual Gilbert dinner (G.R.U.B.). There were only 9 of us this year. Jeanne had died a few months ago and her husband was taking care of some legal matters out of town. Bill was playing Don Quixote in a production of Man of La Mancha so he and his wife didn't come. Roger was home taking care of his sick partner. But it was kind of nice having the smaller group. More chance to visit with everyone. We arrived at 7, but the last person in the group didn't get there until after 7:30, so several people at tables around us came, ate their dinner and left before we actually started ordering. Dinner was fabulous. And lots of it. We laughed a lot, we ate heartily. We offered our standard toast to Gilbert ("Oh, it's you") and then toasts to the two other people from the group whom we have lost over the past 21 years. 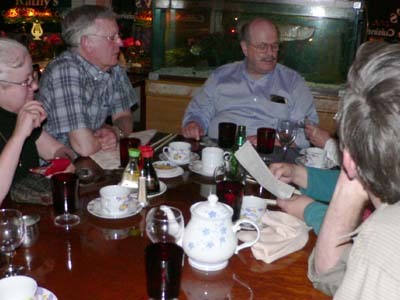 When the bill came, since we had eaten family style, we would agreed to split the bill 9 ways. Henry usually tallies up what everyone owes, but Will took the job off his hands this year. After much hemming hawing, taking the bill over to a brighter light to read it better (all of us have failing eyesight), pulling out a calculator, a pencil and a pen, it was finally decided that we each owed $25, and a bargain it was at that (especially since that included wine, more than one glass for some, and tip). We all passed our money up to Will and he began to count it and that's when the trouble began. For some reason he was $20 short. We all began checking our wallets and trying to remember what we had in there before dinner and looking to see if we might have handed him a $5, thinking it was a $20. Will remembered that he had gone to the ATM machine and the only thing he did after that was to have his car washed for $7-something and to buy a bag of kitty litter. He was trying to check his wallet by the dim light to see if he had the right change left over from car wash, kitty litter and $25 for dinner. The discussion went on at great length. By this time we were the only patrons left in the restaurant and it seemed that the staff in the back was making an unusually loud racket cleaning up the kitchen. Finally it was decided that people should each add another $5 (which, of course, if you multiply that by 9 adds up to $45, and the cash was only short $20). More discussion ensued about who had given additional money and who wanted to give additional money, who had $5 bills, who had $1 bills, etc. About this time, the lights in the restaurant dimmed, ever so slightly and then brightened again, like you would flash lights in a theatre lobby when it was time for the patrons to enter the theatre itself to see the show. We decided this was a subtle hint that the staff wanted us to get the hell out of there so they could clean up and go home. I'm not sure what the final solution was, since Walt was paying for my dinner. I don't know who paid extra and who didn't add to the extra, but it really didn't matter. What mattered was getting us out of there and letting the people close up their restaurant. It really was a fun evening. But I don't know that we can ever show up at Kathy's Chinese Restaurant again. They might lock the door when they see us coming! "Now how much was the kitty litter?"